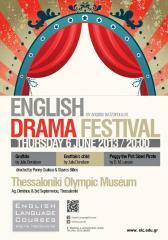 This year, for the first time at English Language Courses Argiris Hatzopoulos the Drama Club was established. Students were separated in groups of 8, according to their age and level of English and, under the teaching and guidance of dramatists – actors Penny Graikou and Stavros Billios, they participated in collective activities combining games, imagination and movement. Through these activities, which took place in a “free” environment (without the stress of control and evaluation) for two hours every Saturday, students learnt to dramatize events from the world of fantasy (fantasy play), read and comprehend texts written in English and identify with characters and their emotions. They were also given the opportunity to practice interpreting roles and representing situations. The three performances we are about to watch today are the end product of this effort which will surely be continued.